Can you believe Valentines Day is this weekend? What’s that, you say? You just started a Whole30 and now you have nothing to make for Valentines Day? Well, you’ve come to the right place! It’s true, navigating holidays and special occasions is hard when you’re on a Whole30. But have no fear! You can still serve your significant other a delicious (and impressive) dinner this weekend, even without the wine and chocolate. 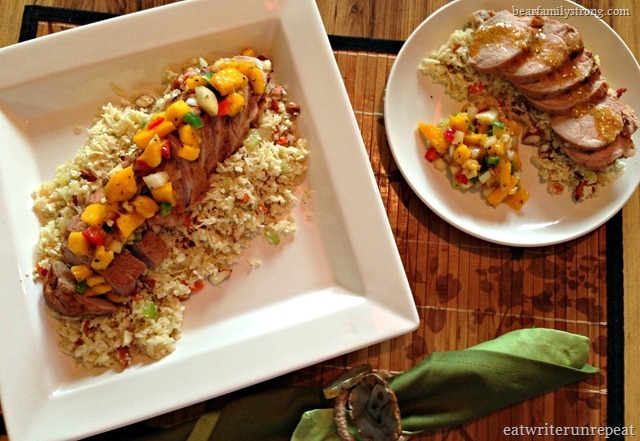 Pork tenderloin is one of my favorite entrees to make when we’re having company. It’s elegant, impressive, and incredibly easy to make. Not to mention the fact that there are about a million seasoning options, and it pairs well with a plethora of side items. 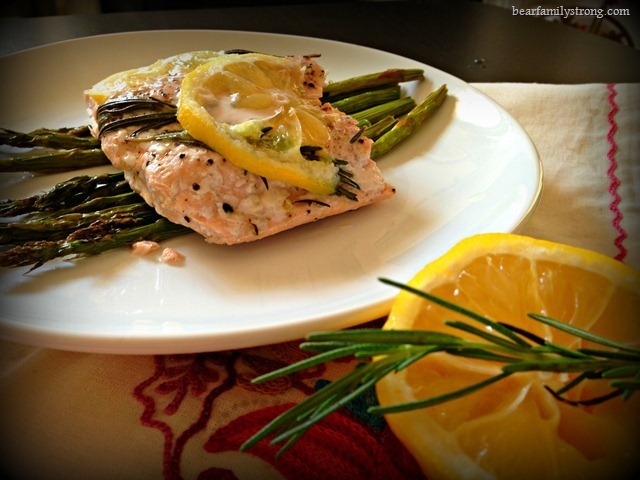 Try it marinated in olive oil and fresh chopped herbs. Love it up with a spicy dry rub. 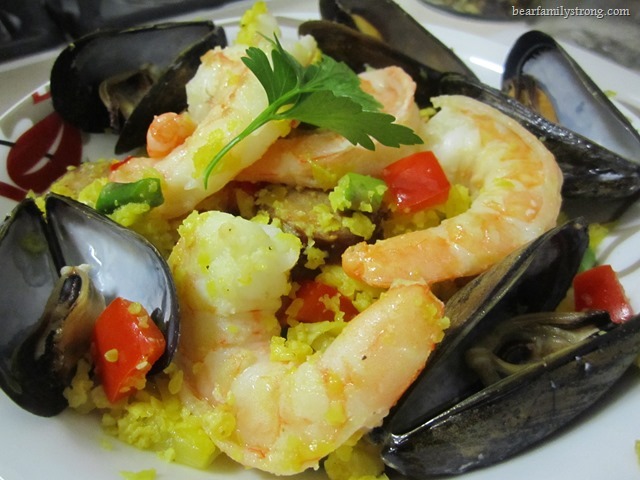 Serve it up alongside a plate of cauliflower rice pilaf and some mango salsa for a light and easy springtime meal. 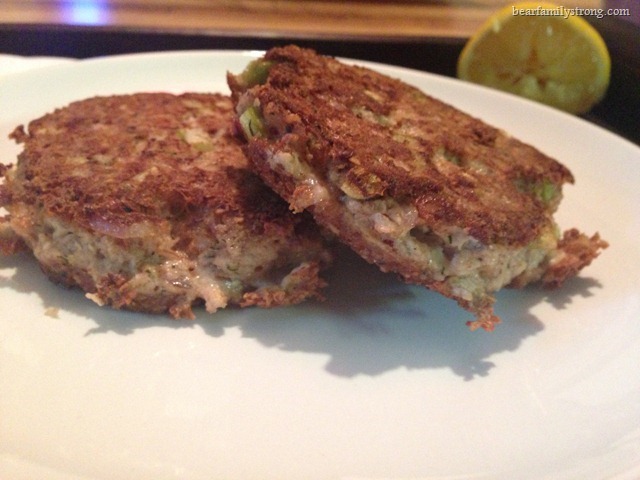 Try it with roasted butternut squash and brussels sprouts for a hearty winter dish. For classic comfort food, try a side of whipped potatoes and some sauteed green beans. 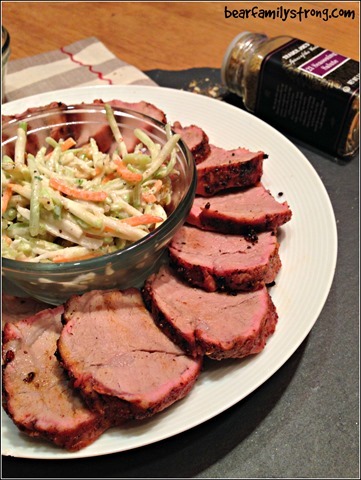 For this particular dish we kept it simple: grilled pork tenderloin with rainbow slaw! 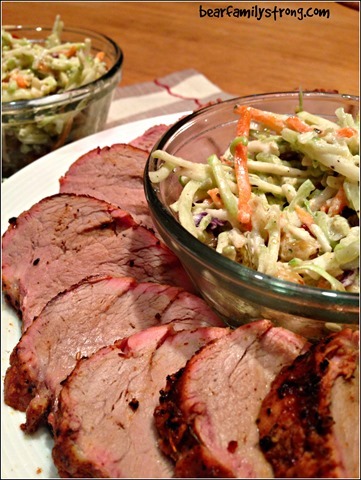 I don’t know what it is about pork and coleslaw, but I can’t get enough of it. I think it started with loading up a pulled pork barbecue sandwich with gobs of sweet, creamy coleslaw – I die. So when I was looking for something to pair with our pork tenderloin the other night and spied a jar of homemade mayonnaise and a bag of shredded “rainbow salad” (broccoli, cauliflower, carrots, and red cabbage – thank you, Wegmans! ), it was game on. There’s another reason I really love the idea of serving this for Valentines Day. What tends to happen to me every year, without fail, is that the Husband and I will splurge on a super expensive meal at a super expensive restaurant, complete with a super expensive bottle of wine and some decadent dessert. And every year, without fail, I go to bed with an upset stomach, grumbling about how much food I ate. Well, every year except the one where the Husband had to work and I showed up with homemade pizza as a surprise. Anyway. This meal won’t do that. Win! Still wondering how you’re going to survive without wine and dessert? How about a nice chilled glass of sparkling water? And instead of indulging in something chocolate and heavy, if you must have dessert, why not a small bowl of berries with coconut cream? Trust me, you’ll feel so much better. Let your pork tenderloins come to room temperature, rinse, and pat dry. While your pork is sitting, combine the spices and set aside. Coat the pork with a healthy layer of olive oil and cover the pork with the rub. Sear the pork over direct heat for about 2 minutes on each side, then continue to cook on indirect heat for about 20 minutes, until pork reaches an internal temperature of 145. Rest about five minutes before slicing. 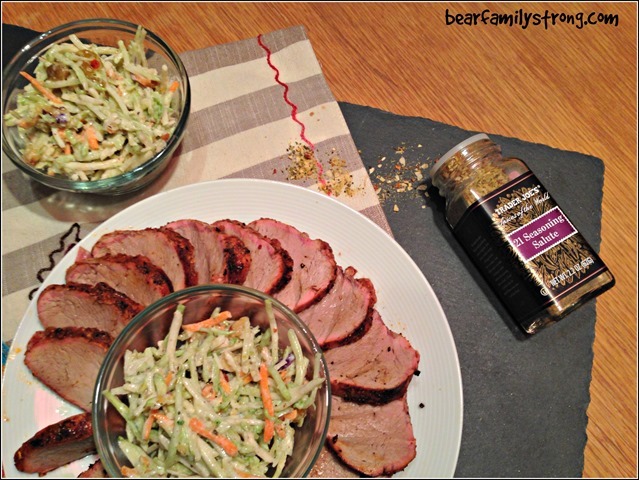 While your pork is cooking, combine all slaw ingredients and stir well to combine. 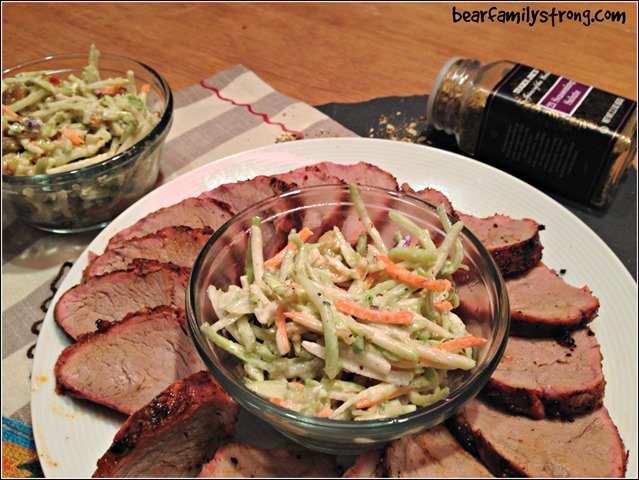 This slaw tastes even better if made ahead and let to sit about 2 hours to really let the flavor sink in. 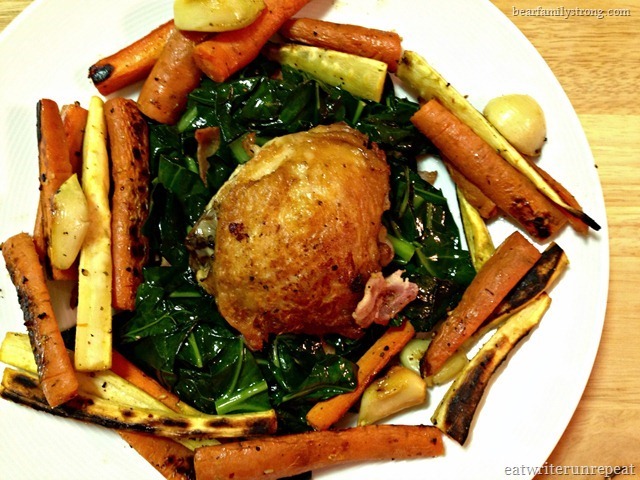 Need some other ideas for your Whole30 Valentines Day Dinner? Try one of these! 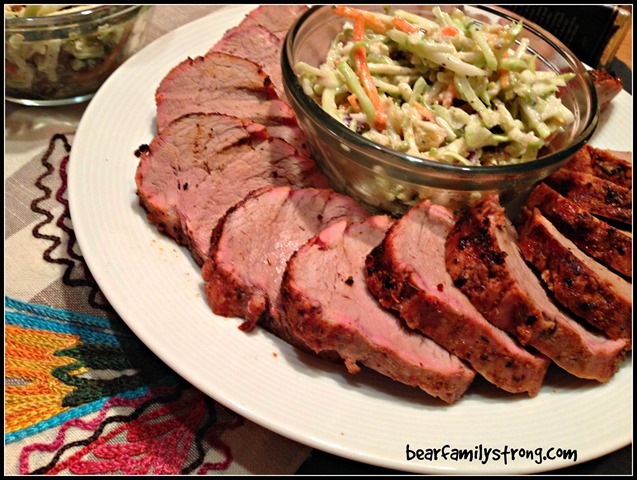 Posted on 10 February 2016 8 February 2016 by BeePosted in Dinner, Holidays, Paleo, Whole 30Tagged cabbage, clean eating, coleslaw, holidays, paleo, pork, pork tenderloin, side dishes, Valentines Day, Whole 30.